CEOS WGISS/WGCV Meeting Cordoba, March, 2005. 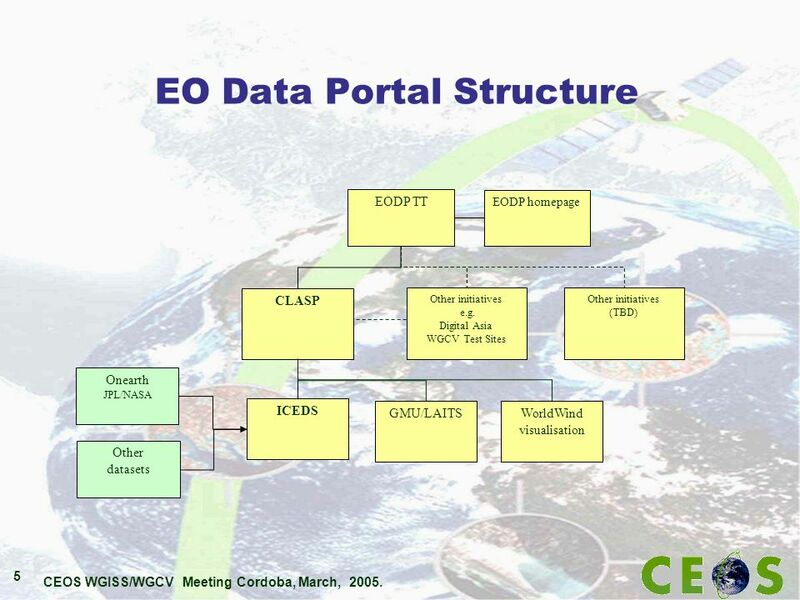 1 WGISS EO Data Portal Introduction Wyn Cudlip BNSC/QinetiQ Presentation to WGISS. 2 CEOS WGISS/WGCV Meeting Cordoba, March, 2005. 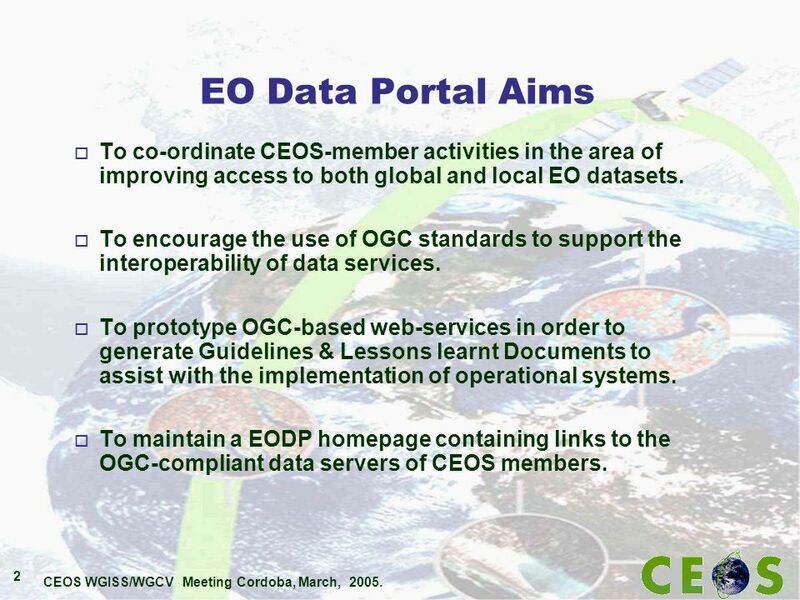 2 EO Data Portal Aims o To co-ordinate CEOS-member activities in the area of improving access to both global and local EO datasets. 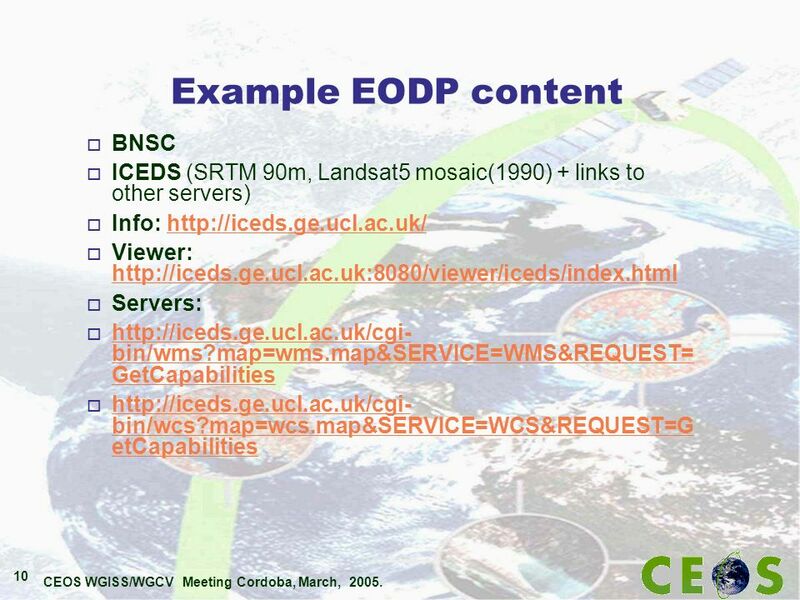 o To encourage the use of OGC standards to support the interoperability of data services. o To prototype OGC-based web-services in order to generate Guidelines & Lessons learnt Documents to assist with the implementation of operational systems. 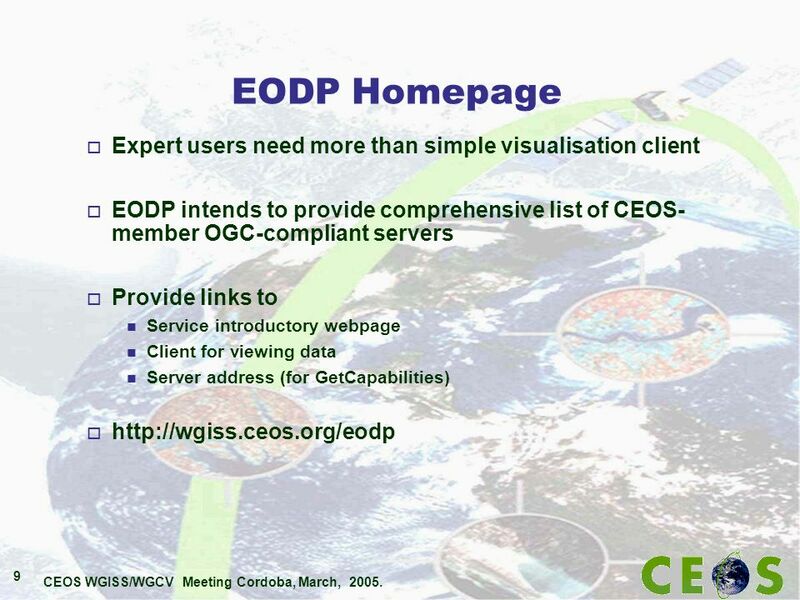 o To maintain a EODP homepage containing links to the OGC-compliant data servers of CEOS members. 4 CEOS WGISS/WGCV Meeting Cordoba, March, 2005. 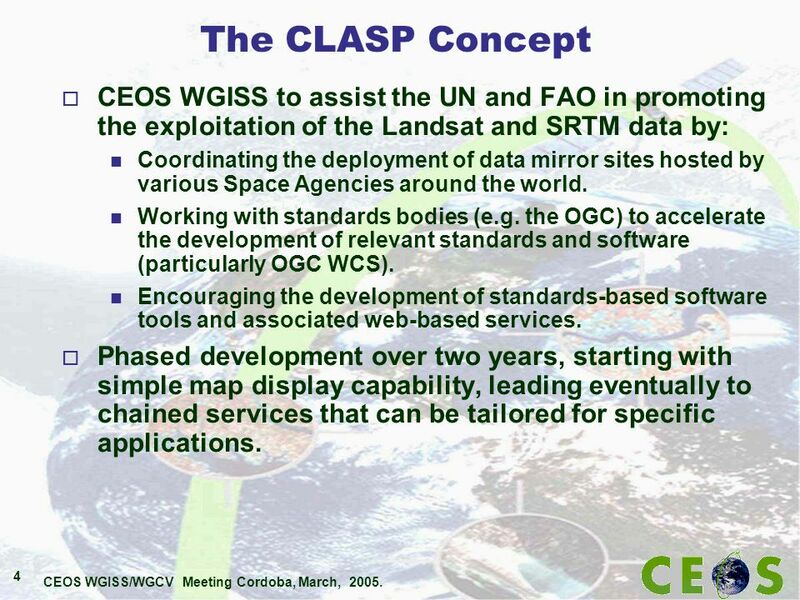 4 The CLASP Concept o CEOS WGISS to assist the UN and FAO in promoting the exploitation of the Landsat and SRTM data by: n Coordinating the deployment of data mirror sites hosted by various Space Agencies around the world. n Working with standards bodies (e.g. the OGC) to accelerate the development of relevant standards and software (particularly OGC WCS). n Encouraging the development of standards-based software tools and associated web-based services. o Phased development over two years, starting with simple map display capability, leading eventually to chained services that can be tailored for specific applications. 11 CEOS WGISS/WGCV Meeting Cordoba, March, 2005. 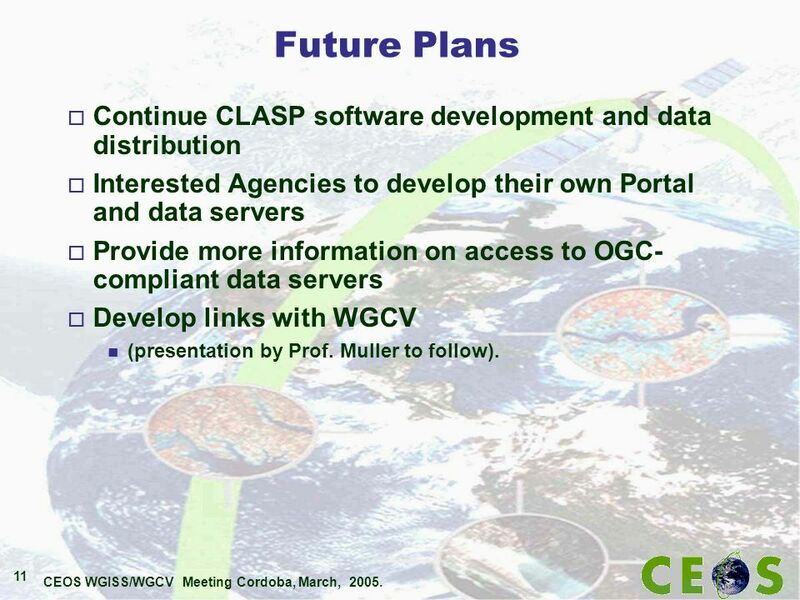 11 Future Plans o Continue CLASP software development and data distribution o Interested Agencies to develop their own Portal and data servers o Provide more information on access to OGC- compliant data servers o Develop links with WGCV n (presentation by Prof. Muller to follow). 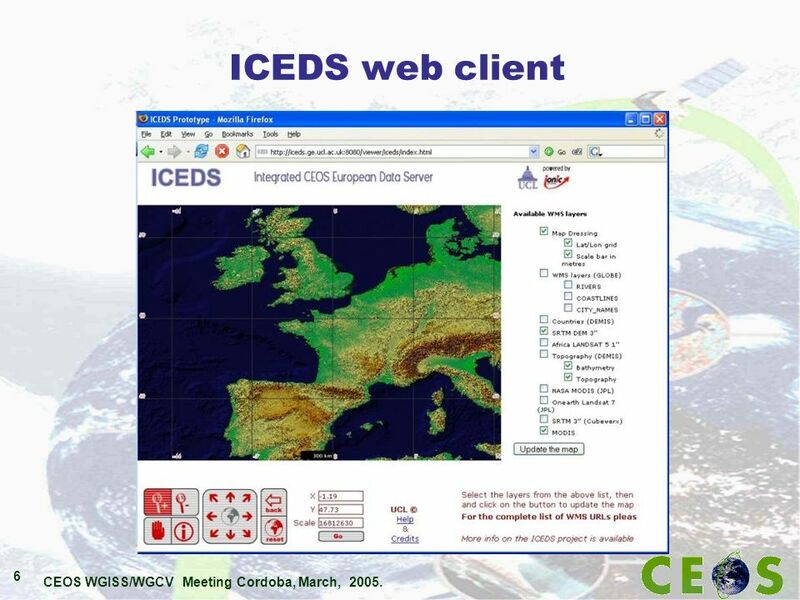 Download ppt "CEOS WGISS/WGCV Meeting Cordoba, March, 2005. 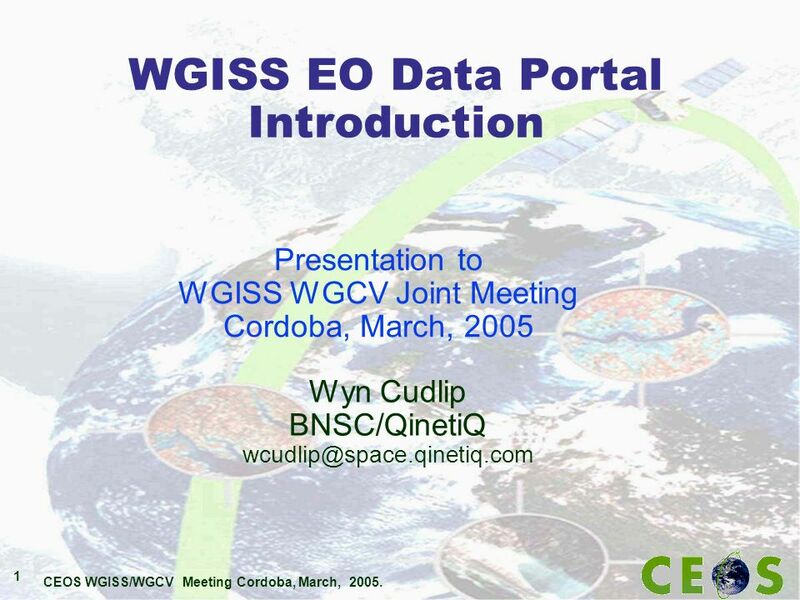 1 WGISS EO Data Portal Introduction Wyn Cudlip BNSC/QinetiQ Presentation to WGISS." Grid Tech Team Certificates, Monitoring, & Firewall September 15, 2003 Chiang Mai, Thailand Allan Doyle, NASA With the help of the entire Grid Tech Team. Project and Applications Subgroup Pakorn Apaphant and Kathy Fontaine Annapolis, MD September 11, 2006. CEOS Project & Applications Subgroup Hanoi May EO Data Portal Task Team Status Wyn Cudlip BNSC/QinetiQ Presentation to Project. CEOS Working Group on Information Systems and Services - 1 Working Group on Information Systems & Services (WGISS) Trends & Progress in Data & Information. CEOS WGISS-22, Annapolis, MD September, GEO Integrated Data Environment NOAA Plan for Integration GEO-IDE Atmospheric Observations Land Surface. Joint WGISS-WGCV Session John Faundeen WGCV-23 & WGISS-19 9 March 2005 Cordoba, Argentina. 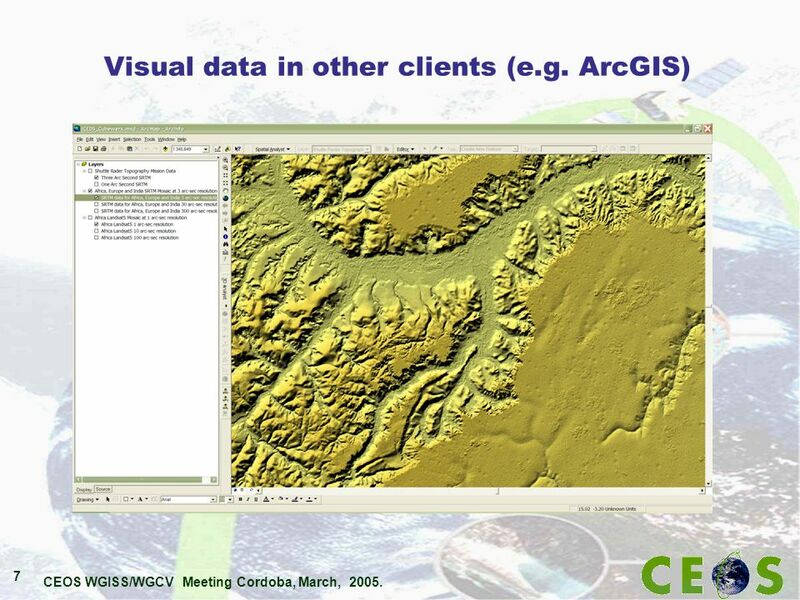 Core Test Sites WTF Projects & Applications Sub-Group John Faundeen WGISS-19 March 2005 Cordoba, Argentina. Deutsches Fernerkundungsdatenzentrum B. Buckl 1 Data Services Task Team CONAE CETT, Thursday, 10th March 2005 Bernhard Buckl, DLR. 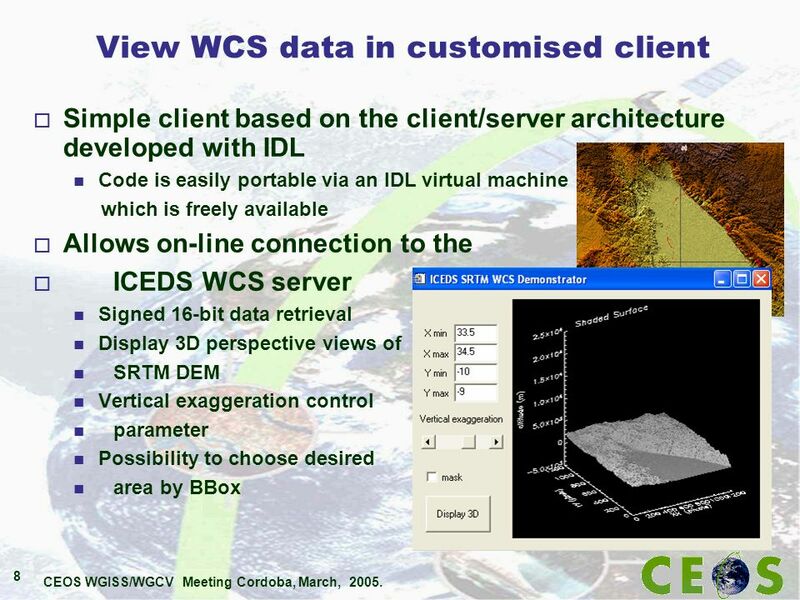 1 SensorWebs and Security Experiences Dan Mandl Presented at WGISS Meeting in Toulouse, France May 11, 2009. Global Change Master Directory (GCMD) Strategic Plan Wyn Cudlip BNSC/QinetiQ Presentation to IDN Task Team, WGISS25. Projects and Applications Subgroup Pakorn Apaphant Kathy Fontaine WGISS-24 DLR, Oberpfaffenhofen, Germany October. 1 NASA CEOP Status & Demo CEOS WGISS-25 Sanya, China February 27, 2008 Yonsook Enloe. Projects and Applications Subgroup Pakorn Apaphant Kathy Fontaine WGISS-23 Hanoi, Vietnam May 21, 2007. 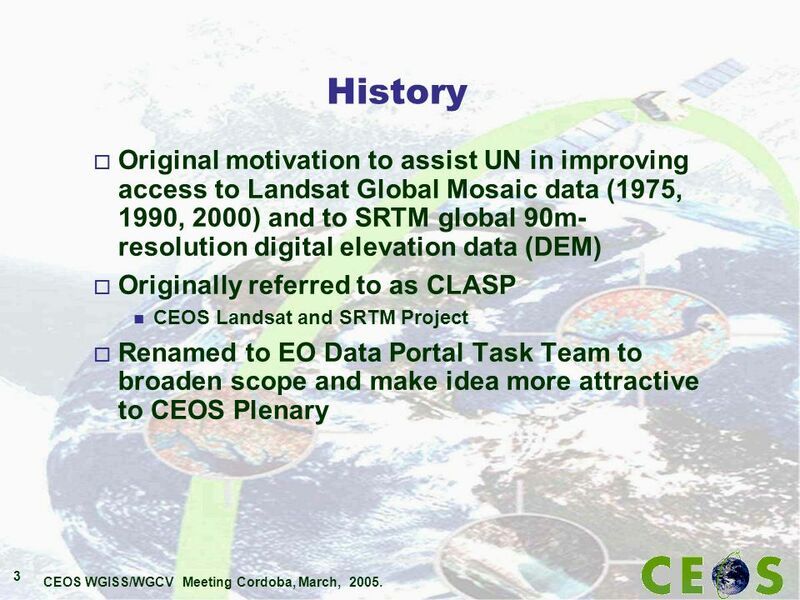 Wyn Cudlip BNSC/QinetiQ Lorant Czaran UN Presentation to WGISS25 China, February 2007 Global Datasets Task Team. CEOS WGISS & Subgroup Meeting Beijing, September, CEOS WGISS Technology & Services Subgroup Overview Wyn Cudlip British National Space Centre/QinetiQ. JAXA network report JAXA/EORC Kengo Aizawa JAXA/EORC Osamu Ochiai. WGISS and GEO Activities Kathy Fontaine NASA March 13, 2007 eGY Boulder, CO.